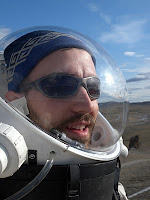 Welcome to the MDRS Crew 89 website! I hope you enjoy following our mission and learn something about what it takes to live on Mars. My name is Brian Shiro, and I am the Commander for the 89th crew of the Mars Desert Research Station (MDRS). My crew and I will inhabit the simulated Mars habitat (the "Hab") from 23 January through 6 February 2010. Previously, I served as Geophysicist on the 2009 FMARS-12 expedition, and I am very excited to be commanding my first mission on analog Mars. In the three months since The Mars Society first selected all of us for this amazing opportunity, our crew has gotten to know each other over many emails and phone calls. We have planned an exciting lineup of research projects encompassing astronomy, biology, engineering, and geology. The common goal underlying all of our efforts is the advancement of human Mars exploration. I don't want to spoil the surprise for you, so you'll have to tune in to this blog or check out our daily reports and photos for more. For the remainder of the week, I'll be at the LunarGeo2010 Meeting in Tempe, Arizona. I'll try to write a post about that experience before I go to MDRS. We are looking forward to seeing all of you on Saturday. Try and get here by noon so that we can have a thorough crew handover. The drive from GJT to the MDRS will take about 2.5 hours. We will prepare lunch for you and your crew. We have already prepared checklists and trouble shooting guides etc. I will send you directions to the MDRS from Hollow Mountain. Have a safe flight and journey. How exciting! What are the main differences between this "hab" and the other "hab"? Which environment is most like Mars?